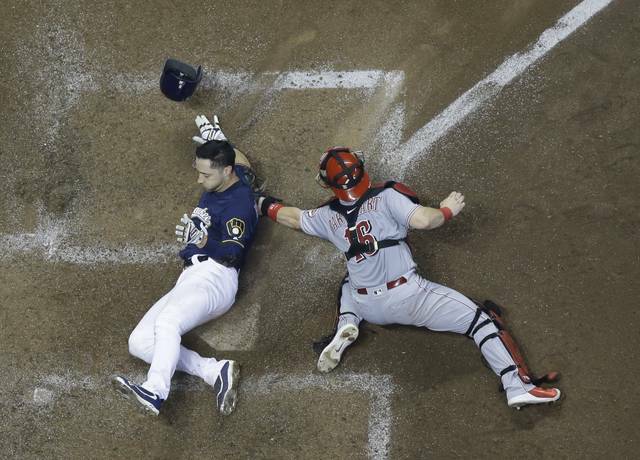 Milwaukee Brewers’ Ryan Braun scores past Cincinnati Reds catcher Tucker Barnhart during the eighth inning of a baseball game Monday in Milwaukee. Braun scored from first on a ball hit by Keon Broxton. 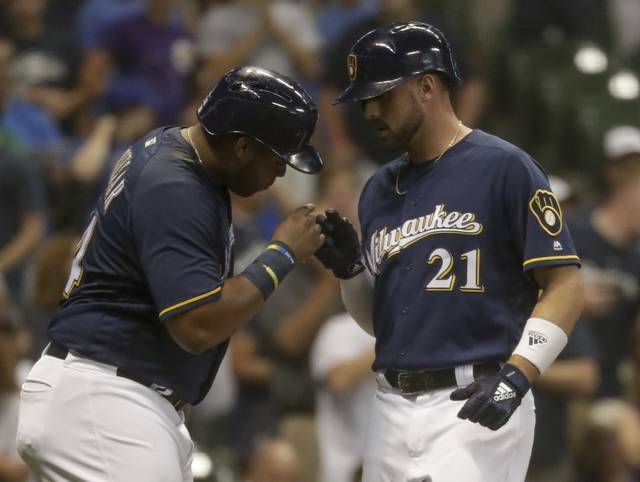 MILWAUKEE (AP) — Travis Shaw and Christian Yelich homered, Chase Anderson settled in after giving up two solo homers and the Milwaukee Brewers rallied for a 5-2 victory over the Cincinnati Reds on Monday night. Anderson, pitching on seven days’ rest, entered tied for the N.L. lead with 24 homers allowed and gave up second-inning solo shots to Eugenio Suarez and Phillip Ervin as the Reds took a 2-0 lead. Anderson then retired the final 14 hitters he faced. 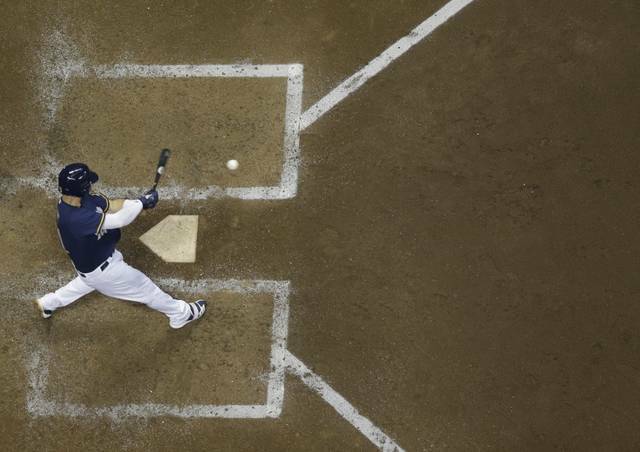 The Brewers added two runs in the eighth on a pinch-hit RBI triple by Keon Broxton and Manny Pina’s sacrifice fly. Anderson now has allowed 26 homers in 135 1/3 inning, after giving up just 14 in 141 1/3 innings last season. Brewers: RHP Matt Albers, on the 10-day DL (left hamstring strain), is back with team and could be activated soon. He pitched three scoreless rehab outings with Double-A Biloxi, including one Saturday. “He’s ready. We weren’t planning on activating him today unless there was a need,” manager Craig Counsell said. “We’ll kind of go with that for the next couple of days, depending on need. … RHP Joakim Soria, also on the DL (right groin), will pitch off the mound on Tuesday and face hitters. Brewers: RHP Junior Guerra (6-8, 3.73 ERA) makes his 24th start. In his last outing, allowed seven runs - six earned - on nine hits in 3 2/3 innings in an 8-4 loss to the Cubs. He is 0-1 with a 5.60 ERA in three starts in August. https://www.limaohio.com/wp-content/uploads/sites/54/2018/08/web1_121192038-d48cb22c926c46db9e6d5ebc89172aeb.jpgMilwaukee Brewers’ Ryan Braun scores past Cincinnati Reds catcher Tucker Barnhart during the eighth inning of a baseball game Monday in Milwaukee. Braun scored from first on a ball hit by Keon Broxton.